Alt: Below the words “10 years,” a doodle party for CommunicateHealth’s birthday is in full swing. The CommunicateHealth principals are there, celebrating with a large group of doodle characters. 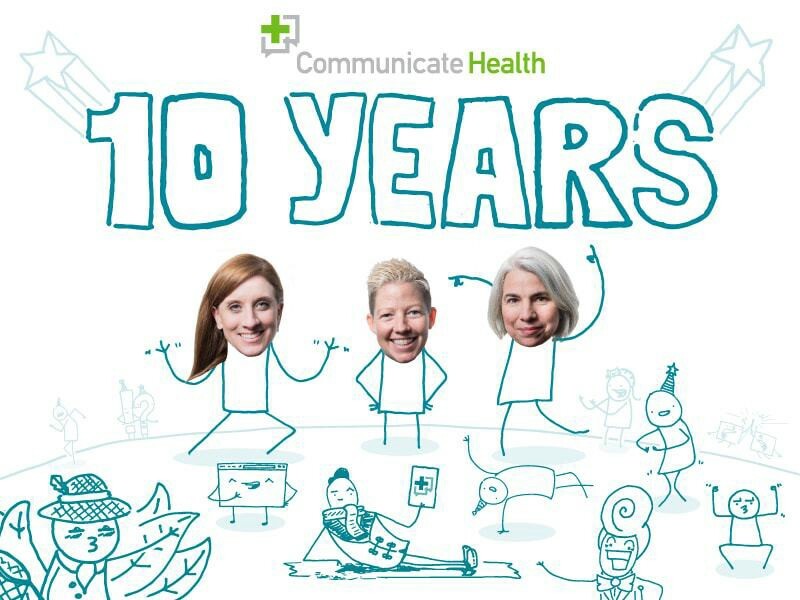 Put on your party hats and grab some cake, dear readers—it’s CommunicateHealth’s 10th birthday! We’ve officially been in the business of health literacy and clear communication for a full decade, and we couldn’t be more excited. You know we love a good statistic here at We ❤ Health Literacy Headquarters, so here’s an interesting one. According to the Bureau of Labor Statistics, only 3 in 10 businesses make it to their 10th birthday. We’re so proud to be one of them, and we can’t wait to see what the next decade brings. Of course, we’d be nothing without our fans and supporters—that’s you! Your devotion to our shared cause truly inspires us every day. We ❤ Health Literacy is our very favorite way to keep in touch with plain language enthusiasts like you—so if you want to hear our thoughts on a certain topic, just let us know! It’s all we want for our birthday. Well, and for you to encourage your fellow health literacy geeks to sign up. Oh, and… just kidding. We wouldn’t want to get greedy. The bottom line: On our 10th birthday, we send huge thanks to our supporters—we couldn’t champion health literacy without you.